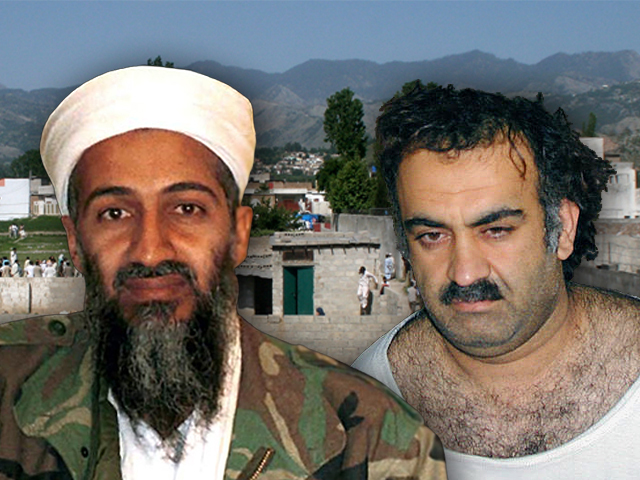 Images of Osama Bin Laden and Sheikh Khalid Mohammed over the compound in Pakistan where bin Laden lived and was killed. Jose Rodriguez, the former head of the CIA's counterterrorism center who oversaw the use of "enhanced interrogation techniques," gave his first public interview to Time magazine this week to defend the role the use of techniques like waterboarding played in the operation against Osama bin Laden. The question of the role such techniques played in this mission arose after reports revealed that two key terror detainees -- Khalid Sheikh Mohammed and Abu Faraj al-Libi -- gave American officials the nickname of a courier who ultimately led U.S. intelligence officials to bin Laden. The two detainees gave the initial information up at foreign CIA "black sites," where waterboarding -- historically considered a form of torture by the U.S. -- and other "enhanced interrogation" techniques were used. "Information provided by KSM and Abu Faraj al-Libi about Bin Laden's courier was the lead information that eventually led to the location of [bin Laden's] compound and the operation that led to his death," Rodriguez told Time. Rodriguez ran the CIA's CounterTerrorism Center from 2002 to 2005, when KSM and al-Libi were taken into custory and subjected to "enhanced interrogation." The Justice Department investigated Rodriguez last year for the destruction of videos showing the interrogation of senior al Qaeda officials, but Rodriguez was cleared of charges. The White House and other officials have played down the significance of enhanced interrogations in the operation to hunt down bin Laden, but Rodriguez's remarks drew one of the White House's strongest criticisms yet. "There is no way that information obtained by [enhanced interrogation techniques] was the decisive intelligence that led us directly to bin Laden," National Security Council spokesman Tommy Vietor told Time. "It took years of collection and analysis from many different sources to develop the case that enabled us to identify this compound, and reach a judgment that bin Laden was likely to be living there." While KSM and al-Libbi gave U.S. officials the nickname of the courier that led to bin Laden, it took years for the CIA to learn the courier's real name and eventually track him down. That information was uncovered after President Bush had ceased waterboarding and shuttered the CIA black sites. Rodriguez told Time that the information from al-Libi was the most important. Al-Libi was not waterboarded, but a week after being subjected to other "enhanced interrogation" techniques, he gave the CIA the tip that the courier only ran messages to bin Laden about every two months or so, Rodriguez said. "I realized that bin Laden was not really running his organization. You can't run an organization and have a courier who makes the rounds every two months," Rodriguez says. "So I became convinced then that this was a person who was just a figurehead and was not calling the shots, the tactical shots, of the organization. So that was significant." As the Hotsheet noted Tuesday, the CIA in 2006 closed its unit dedicated to finding bin Laden, though agents said tracking him remained a high priority. President Obama put renewed focus on the hunt for bin Laden when he took office. Rodriguez said that the U.S. should revive its "enhanced interrogation" because without it, "it will be hard for people in important positions to be able to deal with terrorists." White House Press Secretary Jay Carney said yesterday there has been "no change whatsoever" to President Obama's opposition to the use of enhanced interrogation techniques.